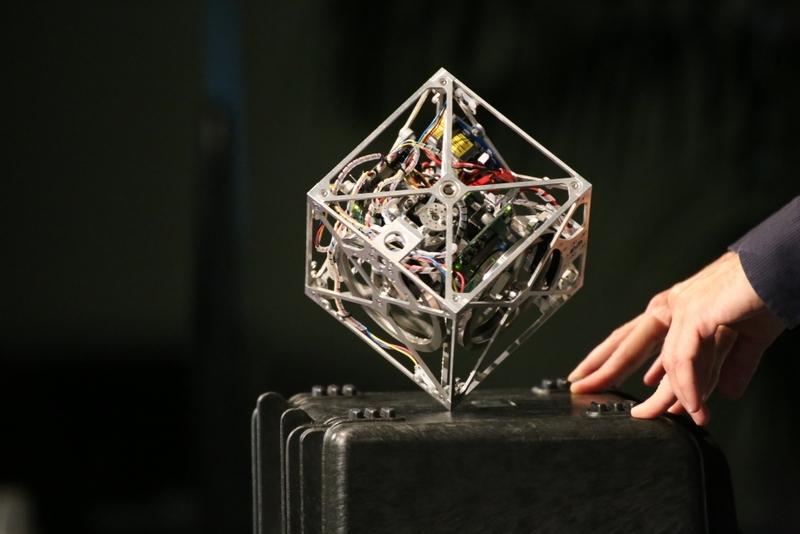 The Cubli is a mechanical cube that can autonomously balance on an edge or corner, jump and even "walk" with the help of reaction wheels that maintain its balance, control its fall or propel it. It’s already happening: Machines, spurred by massive gains in processing power and versatility, are poised to change life as we know it. Thanks to ever-improving algorithms and the ability to make a multitude of calculations per second, these machines can operate autonomously and with precision and speed. More importantly, they can learn, and perfect in a few hours what a human being would need years to accomplish. Is it the stuff of science fiction come to life, with sophisticated robots that can do a human’s bidding? Is it the beginning of a dystopian future, in which people are the ones becoming obsolete? If you ask Raffaello D’Andrea, distinguished guest lecturer in UC Santa Barbara’s College of Engineering, he might tell you it’s a little bit of both. 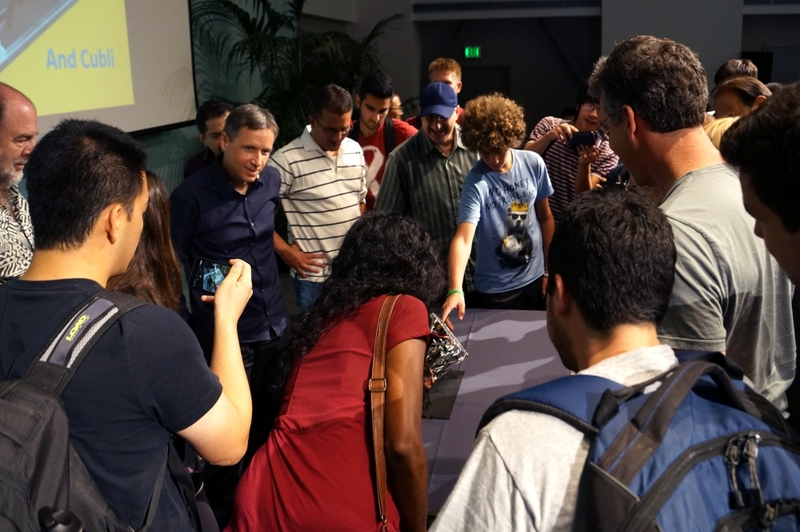 In a talk titled “Engineering the Future: Feedback Control and the Coming Machine Revolution,” the engineering professor, dynamic systems expert and new media artist discussed the state of the technology, where it could be going and how society might be impacted as machines get smarter and humanity becomes more reliant on them. 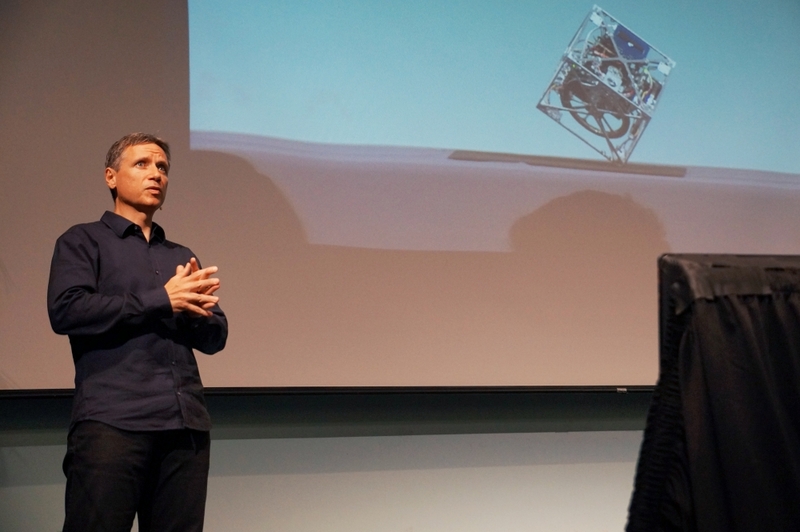 “There are various technological and algorithmic and social pressures that are really causing this coming machine revolution,” D’Andrea told the audience that filled UCSB’s Corwin Pavilion. 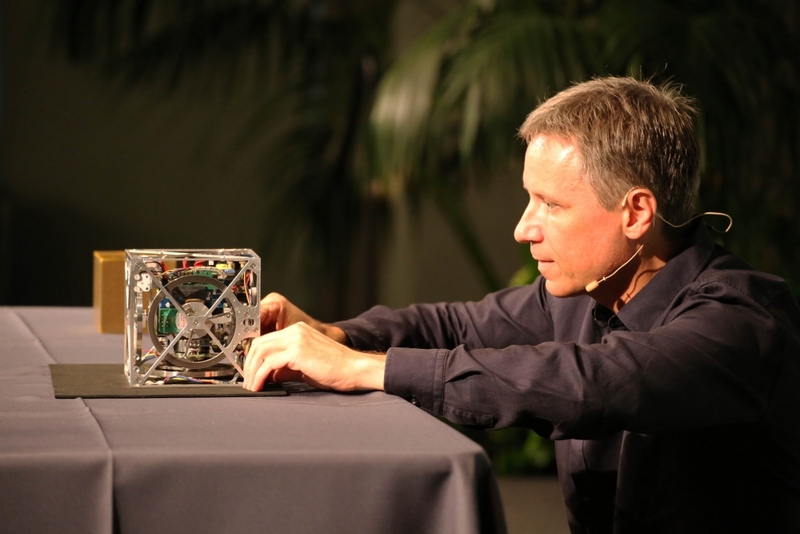 He recounted his experiences developing the robotic warehouse management technology known as Kiva Systems (now owned by Amazon), an intricate dance of robots that can fulfill thousands upon thousands of orders with speed, accuracy and minimal human involvement. To further illustrate the advancement of today’s machines, D’Andrea, a professor at the Swiss Federal Institute of Technology, demonstrated his work with flying machines: quadracopters that can fly in synchrony, flip and recover in midair, compensate for damage, build things and even charge themselves. His work has been featured by Cirque du Soleil. 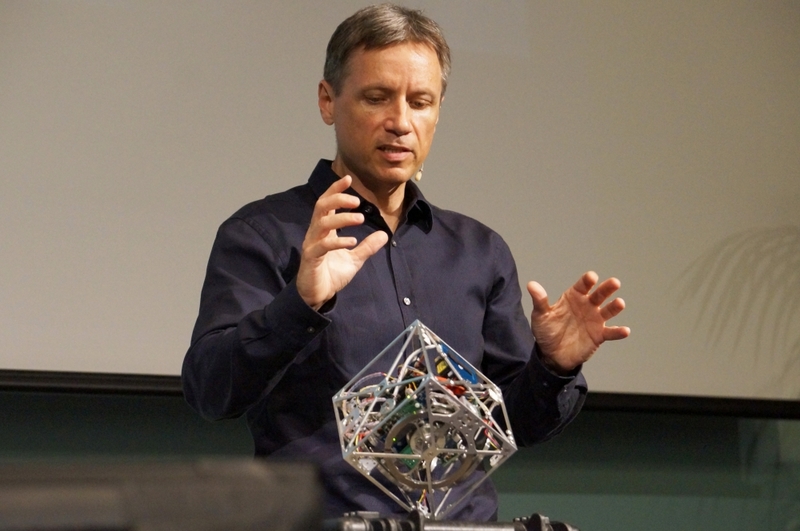 For the audience, he gave a live demonstration of the Cubli, a robotic cube that balanced when tipped on its corner, and could jump to one of its sides. With sensing and feedback control at their peak and still gaining in sophistication, and processors becoming smaller and more powerful, other elements are ripe for advancement, D’Andrea noted. 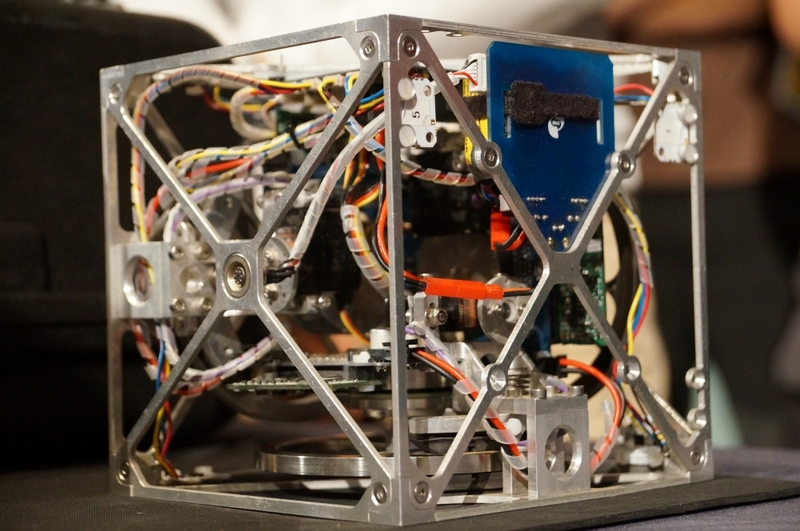 “If you could create a battery that had 10 times the energy content, it would revolutionize things,” he said. Other improvements that could drastically enhance the state of the art would be in the areas of actuation — the translation of energy into movement or function of a machine — as well as learning, where machines could progressively boost their performance with each attempt at a task. However there were also three major concerns D’Andrea outlined in his talk. “I think people that tell you that robots and automation will not displace jobs are just wrong,” he said. “Robots do displace jobs.” The development of a robot-based workforce might create jobs in some areas, he added, but the gains in automation would ultimately outpace the need for people. Other concerns included the use of machines in warfare, specifically the threat of continuing escalation between technologically advancing societies. Significant societal changes would be necessary to compensate for the impacts of these advances, he said. In addition to these two issues, a third – hyperdependence on machines – is another growing concern for D’Andrea, who perhaps unknowingly illustrated his own point by having to stop to look at his computer to remind himself of this topic. Anyone who has gotten lost while following GPS navigation instructions can attest to that vulnerability, he said. Members of the audience added to the list with concerns of their own, such as issues of privacy rooted in the increasing use of camera-equipped drones, and environmental problems that result from the accumulation of discarded parts. No concrete solutions have been identified to address the emerging drawbacks, and D’Andrea argues that humanity will have to take an active part in dealing with them as they come. “It’s up to people,” he said. Honesty in acknowledging the effects of increasingly more sophisticated machines, societal controls and even a shift in the approach to the economy might be part of the strategy. Suppressing robotic technology, with its potential for good that exists alongside its probable drawbacks, is not possible, he noted. “It’s not even consistent with who we are as a species, with our sense of discovery and creativity,” he said.